Okay, here is a bit of a departure from my normal reviews. This is an iOS app for both the iPhone and iPod. I haven't done a review like this before so hopefully someone finds it helpful. The graphics used for the clock were entirely hand-designed by myself in 3D. The tubes are a mix of features from a National NL-5025 and a RFT Z5660M with a whole bunch of inspiration from just about every other nixie tube I could get good reference images on. Every single component required to create a physically viable nixie tube is present and proper mechanically- the tubes are even accurately wired up, the cathodes are insulated from each other and the anode, etc. There is no reason why they wouldn't work if they were real (part of the reason why I created Numatron 2 was to see just how accurate I could make everything). Likewise, the lighting effects required a fair bit of research into gas discharge tubes and the theory behind them. Most of my research eventually made its way into a set of 3D shaders that I used to create (what I believe to be) the first accurate 3D simulation of a volumetric discharge glow ever created. From start to finish, the project took about 3 months. I refused to release the application until all of my (rather excessive) expectations were met. 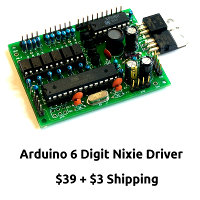 It wasn't good enough to "look like" a nixie tube. Numatron 2 had to be instantly recognizable as a nixie clock to anyone who was previously familiar with them, and in that regard, I believe I succeeded. It's a cool app - I think you'll like it!